As Secret Wars rolls on more news is coming out about the state of the Marvel Universe once the event has finished. 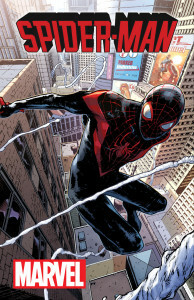 Now Marvel have revealed via an article given exclusively to the New York Daily News that this Autumn not only will Miles Morales be joining the main Marvel universe but he will also be the lead of the relaunched Spider-Man comic. Miles was the Spider-Man of the Ultimate Line of of comics after that Universes Peter Parker died and survived the destruction of both the Ultimate Universe and the Main Marvel Universe in Secret Wars #1. He is currently on Battle World and we have yet to see how this will lead to him in the main Marvel Universe or what exactly that will look like. Many kids of color who when they were playing superheroes with their friends, their friends wouldn’t let them be Batman or Superman because they don’t look like those heroes but they could be Spider-Man because anyone could be under that mask. But now it’s true. It’s meant a great deal to a great many people. No word yet as to what this means for Peter Parker who also survived Secret Wars #1 however Marvel will mostly likely have multiple Spider-Man titles and the eagle-eyed among you may spot the Parker Industries billboard in the background of the cover. Could this mean that Peter will be a CEO while Miles takes over not only the main title but also the traditional struggling to balance Super-Heroing with a normal life aspect of the character? With the creative team of writer Bendis and artist Sara Pichelli lots of fans will be excited to find out.